Mount Judah Cemetery is located in the Ridgewood, Queens County, New York, a town that straddles the border between Queens and Kings Counties. In this general area, one can find eight such Jewish cemeteries. Mount Judah is divided into two sections separated by a main road. Nearly two-hundred burials took place here in 2007. Mount Judah was incorporated one hundred years ago in 1908, and took its first burial four years later. Today, Mount Judah holds more than 54,000 burials within its more than three-hundred society plots. Its website can be found at www.mountjudah.com. For the last twenty-three years, Todd Ivler has been the General Manager of Mount Judah Cemetery. He is a man who is very dedicated to his work. He is affable and extremely helpful to those who need his assistance. In essence, he is the model of what a cemetery manager should be. Todd sat down for an interview with the Museum of Family History and most graciously and openly answered every question put forth. Below are edited excerpts of the interview, the questions and answers arranged by subject. It is important to note that every cemetery is different. Each has its own policies (although their policies may be similar or the same), e.g. whether it has to do with how they care for their grounds, how they might number a grave or row in a particular plot, how their searchable database may be structured, etc. In general, one should consider what is stated in this interview only to be true of Mount Judah Cemetery. If you have a question about specific policies or other matters concerning another cemetery, you should contact them directly. 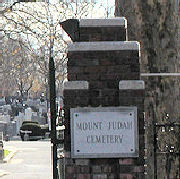 S: Was the cemetery always called Mount Judah? T: The corporate name is called Highland View Cemetery Corporation, but most people probably wouldn’t know unless they had a deed to a grave from us. It's probably called that because we're right on Highland Park. I don't know how or why they chose the name Mount Judah. S: There are a least eight Jewish cemeteries in Ridgewood and Glendale. Why is that? T: When this cemetery first opened in1908, the cemetery incorporated. It took four years to map it out, and in 1912 we had our first burial. The area around Ridgewood was the end of the line. Basically, there was nothing past here but farms. It wasn't close to where people were living. And this area is where they decided to build the cemeteries. S: I read that there used to be a law in New York that you can only have so much land dedicated to cemeteries, so cemetery organizations bought land that straddled two counties so they could own a larger tract of land for their own cemetery. T: I’ve heard that, because we're on the Brooklyn-Queens borderline, and it was something that I was not really aware of. But there was a law passed a number of years ago saying that there can be no more cemeteries built in the metropolitan area. S: Then it's not a question of whether the land is available for purchase or not? T: I know that they were not designating any more burial space. Hence, this is the reason why cemeteries began to be constructed further out on Long Island. T: They would not approve it. That’s why Washington Cemetery is doing what they’re doing, doing away with some of their internal roads away to create more burial space. Even if there was a place to expand, you’re not allowed to. S: How many people are buried in Mt. Judah? T: Mount Judah probably has somewhere in the neighborhood of 55 to 65,000 people buried here. It’s hard to have an exact figure because when you look at our database, a lot of graves are "reserved" graves, which are included in the database. The reason for this is that there are a lot of what we call “aka’s” in the computer, where people are buried under two different names. We have to keep the name that the burial comes in under, and then we list them again by the name that other people knew the person as. So this must add to the number of what it our actual number of burials are. S: So there’s no way of knowing how many burials there are here? T: There’s really no way of knowing. We’ve tried to figure it out, because years ago we did not keep records. We did not number each burial as they came in, as some other cemeteries do. And we only began numbering them back in the early to mid-1990s, when we started to go computerized. Every burial had to get a number at that point. S: How many new burials do you have a year? T: Right now, if we do a hundred burials this year, we’d be lucky. When I first started here twenty-three years ago, we were doing three hundred and fifty burials a year. So we’re dropping ten or fifteen percent on a year right now. S: Are all your records computerized? T: Basically yes. Yet we don’t do everything on the computer. There are certain things that are still done with a regular typewriter. But yes, all our interments are on the computer. At least we hope they all are. S: What type of information is contained on an individual burial card that you keep in your cemetery office? T: The only information that we actually keep on the cards or on our computer is where the person passed away—what we call “last known residence.” So if a person died in a hospital, the name of the hospital will be on the card. S: Not the address where they lived? T: Not the address where they lived. As far as the age is concerned, I like to tell people that years ago the age that we had listed in our records was often not the correct age. It’s a little better today as far as age goes, but years ago, people didn’t always know the correct age. S: They didn’t know when they were born in the old country. T: Right, and a year later when they go to put the stone on, they’ve already searched through paperwork, and they kind of found a more correct age. T: Yes, so at least it’s on the stone, but it’s not in our records. And basically, that’s it. S: And the funeral parlor? T: Well, the name of the funeral parlor actually doesn’t go on the burial card. We are putting in on our computer now, but the name of the funeral parlor goes into what we call our “day-by-day” book, which has all that other information on it. S: So if someone wanted to know the name of the funeral parlor that was associated with a person who was buried twenty years ago, where would you have to look? On your burial permits? T: We’d have to look in the day-by-day book. We’d have to pull the book out. S: And when did you start the day-by-day book? T: They were also started back in the very beginning. And the reason why we keep the day-by-day book is when a foundation order comes in, we can go back to the day-by-day book and put the foundation order number information on that. We do this so we know that a stone has been ordered for that person. We can look back fifty years ago and tell you the exact day a monument was ordered. S: What kind of information do you give out to people who stop in the office or who telephone and ask for information about the deceased? Can you supply them with the name—if someone asked for the name of the funeral parlor, would you have to look for it? T: We can give them the name of the funeral home, whether they have any kind of information or not. S: Or whether the funeral home still exist or not. T: Most of them still do, believe it or not, because they were all family businesses back then. So most of them are still in existence. T: The only basic information that I can give them is when the person was buried. We only do date of burial here. I don’t know the exact date of death. You'd have to look on the stone for that. S: Or age at death. T: Or age, this I can give you…. S: How about contact information? T: Contact information we do not give out, but should we have good—what we call “good contact information”—we tell people if you’d like to write us a letter, we’ll be happy to pass it on. And then it’s up to the person, whether they want to answer it or not. S: Is there a burial log that a person can look at? T: Nobody’s ever asked that question, as far as wanting to look at it is concerned. I guess if someone came in here, they could do it, though I don’t know what good it would do anyone. T: Yes, we can definitely pull books out. We refer back to those old books constantly. There are a number of different ledgers that we try to keep up-to-date, when the girls in the office have nothing to do, we add to them the more up-to-date information. S: How many societies are represented here at Mount Judah? T: I would say there’s probably somewhere in the neighborhood of three hundred to three hundred and fifty societies. S: Can you estimate the percentage of these societies that are still active? T: I would think there’s probably twenty-five to thirty percent that might still be active. S: What percentage of these societies do you think have a representative that you can contact if you have a question about a burial or a plot? T: I would still think there’s probably around seventy-five of them that I could contact. There’s still quite a few of them that are active. There are also a lot of societies who own plots that are full. They're no longer active here, but they might be active at other cemeteries. S: Do you have a list of active societies and contact information? T: Not really. Well, I do know for which ones we have people to contact, and on the other hand, I know which ones I don’t have contacts for. S: Do you have much contact with society representatives over the course of a year? T: Well, at this point right now, because we’re getting to be an older cemetery, the number of burials we have each year is dropping. So we don’t have the contacts as we did years ago. When I first started here, I had lot more contact, and I knew a lot of the people from these societies. I used to speak to them on the telephone, or they’d come to the cemetery and say “hello.” But now it’s literally dying out. The members are getting older and unfortunately their kids don’t want to do it. And that’s the reason why a lot of these societies are literally going, going awayside. It’s a shame. S: Do you keep a record of old burial societies at all? Any kind of records? T: No, we don’t really have records from the societies. The only thing I might have is who the signer was for the society years ago. But that information really doesn’t mean anything to anyone at this point in time. S: What does a cemetery manager do? T: A cemetery manager oversees the entire operation of a cemetery, from the outside workers to office staff, and everything that goes on here six days a week. S: How many people do you supervise? T: During the season we have a crew of about seventeen guys on the outside. In the winter months we only have a crew of two to do burials. S: Plus you supervise the cemetery office staff. T: Our office staff right now, besides myself, is two full-timers and one part-timer. S: An old cemetery like yours that doesn’t have a lot of new burials, doesn't make a lot of money. How do you make enough money for everything, for upkeep, to pay salaries, especially if you don’t have a lot of people paying for care of the graves. Where do you get your income from if you only have a hundred burials a year? S: What kind of foundations are you talking about? S: So the cemetery association puts money into a pool, and then whatever’s needed you can take out of the pool? S: It goes into the general fund? T: And then there’s another fund that people get taxed on. I call it a tax, though it's not necessarily a tax. There’s another fund which is called the “vandalism fund,” which every burial pays for; you pay five dollars into that. And that money goes directly to the State. S: What happens if a stone is toppled? Does somebody have to pay for it to be lifted up and placed back on its foundation? Does the society or the contact person for the burial pay for this? T: Well, it depends on how it gets toppled. If it was vandalism, yes, we can go to the State and ask the State for money for…. S: You don’t always know if it’s vandalism or not. T: Well, you know, you could tell it’s vandalism if you go out there and all of a sudden you’ve got fifteen or twenty stones down. S: But after somebody complains…. T: Well, not necessarily. My guys, they walk around outside. If they see something down, they’re supposed to tell the office. S: But most cemeteries in the area wouldn’t do something like that. T: Probably not. We try to do it. I don’t have a tremendous staff on the outside to do it. Plus, comes the Jewish Holidays, we start letting the guys go, and then we start slowly dwindling down to only by two gravediggers, which is in the winter months. S: What happens if a society doesn’t pay for any upkeep? At some point, do you say, even if nobody’s paying, we’ve got to do something to this plot to keep it clean? T: Well, we cut all open areas. S: Even if it’s not paid for? T: Even if it’s not paid for. T: Twice a year, at least. Actually this season, we’ve had a lot of rain. Stuff grows a lot faster, so we…. S: You don’t mean you even clean in between the rows? T: Yes, in between the rows so people can walk and see the graves. S: So you do that for all of them? S: More or less twice a year. T: Years ago, the societies used to pay it. It was called a “maintenance fee.” But I guess as the societies started dwindling out, they had no money, they didn’t have meetings, whatever…They really didn’t have the money to pay for upkeep. S: You want your grounds to look good, so…. T: So the cemetery will still do it. S: So there’s no real reason for a society to pay for care if you’re going to do it anyhow. T: A society will pay perpetual care for their open grounds to make sure that they’re always maintained, and to make sure that their gates are painted and things like that; that some societies will do. As far as the uncared for graves are concerned, some of the older societies, most of the uncared for graves are going to be in the rear of the society plot, because naturally they’re going to be the oldest ones we have. A lot of societies have given us permission to literally rake the areas clean. And then, basically within a year or two, crabgrass grows on it. And then that’s what we cut. We keep it looking neat. It’s a lot neater looking then. But stuff is always growing wild and over the monuments…. S: There are some terribly looking cemeteries out there…. T: Yes, there are. And one thing you've got to be careful is that—never pull anything out of the grounds in the cemeteries, because you never know if you’re touching poison ivy. And most cemeteries are inundated with it. S: You have poison ivy here at Mount Judah? S: They don’t wear gloves? T: No, they don’t wear gloves. S: There are a lot of people who appreciate the fact that Mount Judah, as well as Mts. Carmel, Hebron, Zion and Ararat, and soon Mt. Lebanon, have searchable cemetery databases. They can find much needed information on these databases, such as the deceased’s name, their grave location, the name of the society who owns the plot, and the date of death or burial. I know these databases were created by the same company, so I am wondering what, if any, is the relationship is between all five of these cemeteries? T: Basically the main relationship is that they’re Jewish cemeteries and we stick together. A number of years ago when the union was going to strike the cemetery, the cemeteries banded together to make themselves stronger, so the union probably really couldn’t bully each individual cemetery. S: They were going to strike all the cemeteries? T: Well, they were going to strike one cemetery, but what happened was, the cemeteries said “You strike one, it’s like striking all of us, and we’ll lock the rest of you out.” We became an association of about eight cemeteries. S: What year was the strike going to happen? T: The last strike was in 1998, I think. S: So there was never a strike then? T: Oh yes, they struck for almost a whole summer. S: What was the union? T: Back then it was Local 365. S: What was the actual name of the union? T: I think it was called the Cemetery Workers and Greens Attendants Union. S: And that was after you banded together? T: Well, I guess the cemetery management knew what was going to happen, so they banded together a year or two before the strike actually happened. I think they knew because we all used the same contract lawyer, for the union and all of that. S: Now how long do they have a contract for? T: Well, the contract is always a three-year contract. S: So it’s always open to negotiations. T: Yes. So I guess what happened was, once they struck—they actually struck Mount Lebanon—and after they struck Lebanon, that same afternoon we all got a phone call. We sent our guys home, and that was it. We locked our gates and it (the lockout) could have been for nine months or ten months. S: I’m sure some would like to know what happens from the time a person dies and the family goes to the funeral parlor to arrange for their loved one's funeral, and the time the deceased is brought to the cemetery for burial. The next-of-kin goes to a funeral parlor and they and the funeral director fill out one or more forms. Then, in order for the deceased to be buried, they need to call you up and make arrangements for the burial. I know you can only speak for New York burials, but please tell me what happens on your end when a funeral director calls you up. S: What kind of information do you ask for? T: Basically the only information we need at that point is name of the deceased, and if they know where—or the funeral home knows where—they’re going to be buried. If they don’t know where the deceased is going to be buried, then we go from there. Then we start asking more questions, e.g. family name, next-of-kin name. We might be able to trace it that way. Did the person buy the grave directly from the cemetery? There are a lot of ways of going about finding out where the problem is. S: So what happens then if they call you up and they give you information. Then what? T: Well, if the information is good information, it makes things very easy for us. A lot of times funeral homes are already pre-prepared, if the family had gone in to see them first, which is something that I highly recommend people doing. At that point, we get out our maps, I send the foreman or the superintendent out to the grounds, he double-checks to make sure the grave is empty, to make sure it is the grave it’s supposed to be. If it’s next to a spouse under a double headstone, the grave is a little easier to find, easier then if it was a single grave in the middle of literally nowhere on a vacant line. When we find the grave, at that point we determine that it’s going to be a good burial. We call the funeral home back and make what we call “final arrangements." We get the next-of-kin’s name and set up the day and the date of the funeral. S: So the guys outside bring out some sort of heavy machinery to dig the ground at the gravesite? T: My diggers here do everything by hand. So it takes them from two to three and a half hours, depending where on the cemetery the grave's located. Some areas are softer than others; some areas are all rock. If it’s all rock, it’s going to take longer to dig it. We have pavement breakers that we can use, and jackhammers should we need it, even in the winter, if there’s frost. S: How do they know how wide and how long to make the space for the casket? S: They make the same size regardless…. T: No. Well, we start out at what we call a “standard grave” here at Mount Judah, which is twenty-two inches wide by seventy-two inches long. And they go down five and a half foot deep or so. If we need to open it up a little bigger, if the funeral director tells us they're coming in with a bigger casket, if we have the room around the gravesite, we can open it up some more. S: So it’s up to the funeral director to tell you that the casket is going to be so big. T: We tell the funeral director how big it is. Most funeral directors know that at Mount Judah Cemetery our graves are going to be twenty-two by seventy-two. If I can’t open it longer than six foot, then the funeral director has their own way of being able to get a taller person into a six foot casket. With the foundation, graves are supposed to be eight foot long. But in some of the older cemeteries, you can't get eight foot everywhere. What we try to do is, leave at least the first foot or so for the foundation for when the headstone goes up, so the headstone goes on solid ground. Then we're really only deal with seven feet, sometimes even six foot. Sometimes the lines are short lines, so we have to deal with it at that point. Every incidence is different. Every time you go out there, it’s different. S: Right, because your often dealing with cramped spaces. You don’t know what kind of space you’re going to have for what sometimes and you have to adjust. T: Exactly. You know, we have to keep lines. We try and keep the lines straight. What happened was years ago, when the societies bought the grounds from the cemetery, they bought an area. And then I suppose what they did was take the map to an engineer, and they had the engineer map out their grounds. S: So they decided how many plots they wanted where, how many rows, how many graves per row, etc. They also had to determine how much space to leave between the graves from row to row, and I guess they had to know what the dimensions would be for of each gravesite when they did this. T: Exactly. So if they left eight foot for each grave—nothing’s exact, especially back in 1908—so if they tell you it’s “x” amount of feet long, when you actually get out to the grounds, it might be a couple of feet shorter. So basically it was up to the cemetery every time they dug another line to make sure the lines were as close as possible. And that’s what happened. Now years have gone by. Most of the burials started in the back line and they worked their way to the front line. S: Is this one of the cemeteries where the back row is called "row number one," and the grave at the extreme right of a row is "grave number one," or does this just depend on the society's wishes? T: As far as rows go, that was something that the cemeteries themselves did. So it has nothing to do with the society. That’s just how it's numbered. S: So it’s not different depending on the society? T: Well, most grave number ones, I would think, would be in the back, left-hand corner. S: So this is the policy of a cemetery. There’s no variance with a cemetery itself? S: Let's talk once again about funerals and burials. Let's say that a person is being buried the same day. Who brings over the burial permit? T: The funeral parlor does everything. That’s why a family pays the funeral home. S: Right, but don't you have to receive a burial permit before you can bury a person? T: Most societies issue a burial permit for their own society. Without the society giving us permission to open a grave, we can’t open a grave. We actually get two permits. We get a health permit, and then we get a permit from the society so we can make the burials. S: You don’t get it from the funeral parlor? T: No, no permit comes from the funeral parlor. S: So which are the permits you store downstairs? T: We store both permits. We keep the interment permit. which is the health department permit, and we also keep the society permit. S: Who sends over the permit? How does it get here? T: The funeral director brings them when they come. S: Do they come with every burial? Don’t you have to have it before you can bury someone? T: We need it for the burial. Without it, there’s no burial. S: So the funeral director doesn’t come to every funeral, or does he? T: Absolutely. You need a funeral director here for every funeral. It’s a New York State law. S: How long are you suppose to keep both permits before you can throw them out? T: We never throw them out. We have every single permit here. S: But obviously these are not computerized. You’d have to go downstairs and…. T: No, it’s not computerized. S: Is there any more information on a burial permit than would be in your computerized records? T: No, not at all. Actually, years ago on a lot of those permits, they used to put down how the person died. They don’t do that any more. They haven’t done that in years. Basically the only thing that’s on there now is the name of the funeral home that’s doing the burial, the name of the deceased, where they passed away, and usually a time…. S: So on your cards, and on what you have here on your computerized records, do you actually have the name of the funeral parlor? S: That's fine. So when a person is buried, do you get the rabbi, or does the funeral home? T: The funeral home will get you the rabbi if you need one. They always ask the cemetery if they need one. You know, do we have a rabbi that we can recommend, for instance. S: So you have a list of Orthodox, Reformed…. T: Well, we have one or two rabbis for whom we always give their number out. Most cemeteries probably do the same thing. If the people don’t necessarily live in the area, but want a rabbi to do the burial, most chapels have their own rabbis that they can contact. S: As far as scheduling a funeral is concerned, I know you don’t have any burials and are closed on Saturday. T: We're closed on Saturdays and no burials are scheduled during lunchtime, usually between 12 and 12:45. And basically our day ends at 4:30, at least during the summer months. S: So a person could schedule a funeral or an unveiling at any time within those hours? T: Anytime within those hours. S: So after the funeral the people leave. Before they do, do you have to see the next-of-kin? Are they supposed to come to the office for some reason? T: A lot of times we don’t see anyone from the funeral, unless somebody is paying with their own check and they come in to pay, as opposed to the funeral home paying it. Or they need to come in and sign papers. S: As far as care is concerned—perpetual and annual care—is that taken care at some other time? T: That usually doesn’t come up until after a monument is put on the grave. At that time, we automatically send out a planting notice or a gardening notice to plant the grave, after the stone is set. There’s nothing to be done until that time anyway. S: And after the people leave, when the funeral is over, do your groundskeepers fill in the grave with the dirt? T: Well, sometimes people stay, they want to see it to the end. Yes, they fill all the dirt back in; usually most of the dirt that came out of the grave, goes back into the grave. That’s why you see a mound on new graves. It’s higher than the ground level because of the space the casket takes up. S: Then they level it off? T: Eventually new graves do settle like anything else. We don’t compact the dirt at that point. Normally within the first week or so, you get a little settling in the grave. Should it rain, it’s going to make the grave settle a little faster. S: As far as the searchable databases go, why do you think these five or six databases were created after all those years? T: I think modernization, more than anything else. I think also to alleviate a lot of the phone calls to the office, where it took valuable time away from their work. A lot of these offices have only two people in them, sometimes three people, and if we’re busy, doing monument work or this work or that, or if somebody’s not in the office, or they're checking the grounds, there's nobody here to answer the calls, or at least not enough people to do their work and also answer a lot of calls. S: Do you think your online searchable database is accomplishing its purpose? T: I do, though I think at times—I’m not saying that it causes more problems—people get interested, they find something, and then they make a call to the office to get other information, or to hopefully find somebody else, which is fine as far as we do it here. It’s really no hassle. S: So what’s this concern about privacy? Why do some cemeteries cite privacy as being the reason they haven't and don't intend to create a similar online searchable database? S: Well, there are plenty of cemeteries that don't want to do it. S: Please explain to be what the default settings are on your searchable database. Why do some burial entries list the first of a month, when the burial didn't take place on the first of the month, or perhaps the default setting lists the same month or year. Why does that happen with the searchable database? T: I guess if we don’t physically put, or if we forget to put a day in, it automatically goes to the first date of the month. In the beginning, there were a lot of mistakes. And you've got to understand, it’s a person that puts the information in…. S: And they didn’t anticipate having a computer and a searchable database back then. T: And that’s probably so. As we come across a lot of these problems, we’re trying to research and update and make everything better, as far as more correct dates are concerned. Look, I’ve even sent my guys out there with a map to sometimes check out where baby graves are at the back of a lot of the societies, old societies, and to check and make sure which name is in which grave number. S: A number of people have told me that they have a hard time locating baby graves, especially the burials from the early part of the twentieth century. Is there a reason for this? Is anything special done when a fetus or a baby or a child is buried? Is anything done differently compared to having an adult buried, either by New York State Law or because of religious reasons? T: A lot of times when a permit comes in, the permit comes in using the mother’s maiden name. So we try and put the married name in, because the people usually would know the married name, not necessarily the maiden name. S: If a person was married, why would they write in the maiden name? T: Because it’s where they go into the hospital. And for some reason, I think, what it does is that it protects the mother. I think I heard this years ago. A lot of times on the certificate from the hospital, it only has the mother’s initials on it. Sometimes not even a full name. That’s more today than years ago. Years ago, a lot of times if it was a stillborn death, of the mother died in childbirth and the child died with the mother, they put the baby in the casket with the mother. And on the monument it doesn’t even have the baby's name—that there was even a baby. S: So in the database, you would put in the maiden name, and you would create another entry in with the married name? Or would you just use the married name? T: Normally what we do is we put in—and how it goes into the database—the married name, comma, the mother’s first name, and then her maiden name. S: At one time you told me that sometimes a person may actually be listed in the database, though the person is not yet deceased. T: That would be what we call a “reserved” grave. Normally, for a reserved grave we’ll have the person’s last name, and then in parentheses the person’s first name, but I wouldn’t want to put somebody’s first name in as a reserve because you wouldn’t really want to look at your name on a database while you're still alive. S: It’s just that there wouldn’t be listed a date where the date of burial is listed. S: …and it wouldn’t say “reserved” for the name? S: It’s your default setting. T: It’s just an arbitrary number that we use. S: So that if one sees no….would it be 1/1/1800? S: So if one sees that, what are the possibilities? That it's a reserved grave, or is there another reason that one might see the year 1800 in the searchable database? T: If they see that, there’s possibly two reasons. One, it would be a reserved grave, and the other would be sometimes it would be what we call an “aka,” where we put the person’s name down as somebody else might have known it. S: But you would still keep the date of burial as being the same. You wouldn’t put in the default setting. T: It all depends on—here again it depends on who’s entering the data sometimes. What they might do is put it in as an 1800, but down on the bottom they’ll list the actual burial date. S: But it goes in the computer as—in the searchable database—as 1800. S: Also, one might find the same person listed twice on your database under different dates. I believe you told me once that this is because a person might have lost a limb which is then buried (and this limb burial is entered into the searchable cemetery database, the date used being the date the limb was buried), and then when the person (whose limb it was) passes away, you create another entry on the database with the later date, i.e. the date the actual person was buried. Why are these burials listed separately? Is the limb and the person (whose limb it was) necessarily buried in the same individual location? Or are limbs normally buried as close to the person as possible? T: Interesting question. The only way I can answer that one is—if the person has a grave here already, whether it be an individual grave or a grave on a family plot, and they lose a limb, under Jewish custom it’s customary to bury the limb. We will bury it in their grave, and then when they eventually pass away, the limb will get dug up. Then we dig the full grave, and depending on the funeral director—either the funeral director sometimes will place the limb in the casket with the person, or we will then, once we get to the bottom of the grave, dig out like a little hole and place the limb under the casket. S: And the location of both is listed on the searchable database as being in the same location? T: Same location because it was the same grave. S: But haven't I also seen on the database that you have the same person with different dates of burial, having different locations, i.e. the limb has a different location than the actual person who was buried? T: Well, if the limb is in what they call a “baby grave,” a small grave, a three-foot grave, then it’s going to be in a different location, and they…. S: Even if it the body part is for an adult? S: Well, most limbs, being fairly small, then would be in a baby grave…. S: Then would you dig out that limb of the person who was buried in that plot? T: That’s totally up to the family. Some families might want us to do this, some families might not. S: But that would be most cases. They’re generally going to want it this way. If the person is living, the person is being buried in the same place. There’s always going to be that opportunity to dig up the limb and put it into the same grave as the rest of the body. T: I would think that most families would want that. They don’t always care though. S: There are also those who find discrepancies in the records on your searchable database, e.g. in the spelling of a given or family name. If a relative feels that an error has been made, can they have the records changed, both on the office burial card and on the searchable cemetery database? If so, what kind of documentation would you need to make the change? Do you make any changes to the searchable database here, or is it done somewhere else, and if so, how long does it generally take to make a change in the record? T: As far as changing the record, we go by the health permit that we receive when the original burial comes in. People have insisted that “No, the name was spelled differently.” We’ll go back and we’ll check. You've got to understand that years ago, a lot of people wrote kind of fancy English type writing, and it all depends who interprets what is written on the permit. A mistake could have been made at that point. S: So if they bring in a death certificate with the correct spelling, that’s good enough to change…. T: Yes, the death certificate should have it correct. S: And sometimes there is a variation in the spelling by just one letter. T: Somebody might be Toby, but it might be Tauba. There’s just…. S: Recently I’ve read an article in Jewish Week about the problems some people have in obtaining an individual plot that’s due them, because they are members of a society and have previously been given a plot by the society officers, but haven’t gotten a deed. The society either went defunct and never deeded out the remaining plots to their members, or the society just became inactive. There is nobody to contact who might have a list of those who had reserved plots. If someone comes to you with such a problem, what could you do? How could they prove they are due a plot if they haven’t any paperwork, and there is no society contact you can call? S: But what can they do if they don’t have proof? T: It’s going to be really tough at that point. If the cemetery has the reserved graves listed on their map, it makes things a lot easier. S: In other words, that person’s name on it, so it's not a problem. But if they don’t…. T: Right. A lot of times people might have to go to the New York State Liquidation Bureau. If the society liquidated, they would have the records. S: They send the records onto the Center for Jewish History in the YIVO Building after they’re done with it. S: According to New York State Law, can a society sell back unused graves to the cemetery for resale? If so, are there restrictions to this? Can you then turn around and sell these plots to those who need them? T: Basically, the only way I get graves now—because most of my land here is allocated or sold—you know I only have a few hundred graves right now—the only way we get graves back is if the society either turns them back to us, sells them back to us, or liquidates legally. Then we buy them back from the New York State Liquidation Bureau. S: So who gets that money? The New York State Liquidation Bureau? T: Once the New York State Liquidation Bureau gets it, I don’t know. They might distribute part of it back. S: But you pay them for the unused graves. S: Is the price for a grave negotiable? Is there a fix price for a …. T: Normally, the price is fixed. It's what the society paid for the grave, plus four percent simple interest from the date the graves were purchased. Basically what that means is that most societies going back into the late 1900s, or late 1920s, 1930s, in that area, most societies paid an average of about seven dollars a grave for each grave on their society grounds. And what happens is the cemetery will give back the seven dollars that the society paid for it, plus four percent simple interest…. T: Per year. So if it was, let’s say from 1920, and now we're in 2008, what are we talking about, eighty-eight years? All right, that’s four percent times eighty-eight years. And it comes out to roughly, for a total of about thirty-five dollars or so. S: And then you can turn around and sell it for a good price. T: And then the cemetery sells it. But here again, you may look at it as a nice profit, but that’s what keeps the cemetery going. T: You know that’s how the cemetery stays afloat. S: If a society goes defunct, do you have any idea of have many graves have been reserved for their members? Do you maintain a list? If a society goes out, or is inactive, and you’re not told by a society representative that all the plots have been deeded out, how do you know how many you empty graves you can buy back and resell? T: If they go out of existence and don’t say anything to anyone, those graves will just stay there empty, in perpetuity. T: We would never know. Not all societies give us reserved graves. Why? Because who knows what’s going to happen down the line? So they don’t want to reserve graves for people. All they know is, well, you’re entitled to a grave. But what does that mean? It's a problem especially if they go out of business. S: So if they don’t liquidate, the graves) just sit there in perpetuity. S: Now Mount Judah’s a Jewish cemetery. Does that mean that non-Jews can’t be buried here? T: Interesting question also. I guarantee you there’s probably non-Jews buried here. S: How do you prove that’s someone’s Jewish that’s to be buried here? S: You’d say they were Jewish. T: …and you knew that they weren’t Jewish, you’re going to sign it anyway because you know you want to get them buried. I don’t know—we don’t open a casket—I have no idea what’s in the casket when the casket comes in. T: So we’re trusting the funeral directors to say whether the deceased is Jewish or not. If the name sounds to me like it’s not a Jewish name, and they call here to buy a grave, you know that’s another story. T: Well, you know you can’t tell, but a lot of people when they call up, they ask if anyone be buried here. And we tell them, no, this is a Jewish cemetery. S: Now I'd like to discuss briefly what kind of services Mount Judah offers family members of the deceased. Do you offer care for the gravesite, e.g. perpetual and annual care? What’s the difference between the two? Can you tell me what the cost for each service is, and what one could expect for such services? T: Well, as far as perpetual care and annual care is concerned, care is care. It’s the same type of care. When we go out there during the season to give the graves care, it doesn't matter whether it has an “08” sticker on it for this year, an “09” for next year, or if it says “endowed care,” as we’re changing our perpetual care stickers to endowed care now, they all get the same care. S: But is there a different frequency of care? T: Well, no. The same frequency. Here’s where the difference comes in. New York State Law changed a number of years ago that had to do with people who had paid money towards perpetual care. Basically now what’s happening is, when these graves go under-endowed, meaning that the initial endowment they paid back thirty, forty, fifty years ago--in today’s standard it’s a low amount of money--they’re not ticking enough interest to care for these graves the same way. So New York State stepped in a number of years ago--the New York State Cemetery Board--and said that the cemetery is to give those graves care that the interest is generating. Not necessarily give it care every time you come up to the grave. Mount Judah unfortunately has no way of telling its workers on the outside which graves have money in it, which graves don’t have money in it, so as long as the sticker’s on the gravestone, it’s going to get cut the same way. S: So basically you’re saying that it’s all getting the same kind of annual care, where people come in and pay for care every year…. T: Annually usually gardening notices go out usually the end of December or the beginning of January for the coming year, with whatever price is on it for that season, and as that money comes in, it’s going to get a sticker on it for that year. S: As far as perpetual are is concerned now, what would someone pay for a simple grave? T: Right now, perpetual care is 2,376 dollars. S: What do most cemeteries do, like Mounts Hebron or Zion, or similar cemeteries? T: Well, I would hope that all cemeteries are trying to contact families of which…. S: And if they can't make contact for some reason? T: What’s happening is that we send out the letters, and a lot of letters come back to us as undeliverable. T: When the letter comes back to us, we mark it in our computer. So if somebody should come in and inquire about that person, we’ll see it in front of us that, well, gee, the mail was returned, and we need to get a current address, and talk to them about perpetual care. Sometimes you have good responses, sometimes you don’t. S: I guess that every cemetery has it’s own policy. T: I would hope that most of the policies are similar to that. S: Are there certain things you can do here that you can’t do at bigger, more active cemeteries? Is there a difference? T: Not really. We probably can’t do what a lot of the big cemeteries do because we’re such a small cemetery. And we just don’t have the funds to do it. S: Is there anything you’d like to do with the cemetery that you can’t do, for one reason or another? S: AstroTurf? Oh, I don’t know about that…. T: Kind of fake grass. When you get down to it, and people come out…. You look at some of the newer cemeteries which are all what they call “lawn plant” cemeteries. You know, they’re easy to cut because there are no high footstones. Everything is, more or less, below ground level. All you have is the family monuments. So big machines cut that. How easy is that to cut? On the other hand, this is an old cemetery and you can’t give up the beauty of it. S: I'd like to talk more about the burying of children and fetuses. Are there any special policies, any religious requirements, that have you do anything differently, than you would for adult burials? How does that work? Is there anything mandated by New York State Law? T: No, actually there’s really nothing mandated by New York State Law. And they're actually changing a lot of the policies. I don’t think they’re keeping the records any more like they used to. S: What do you mean? S: They’re not keeping records anymore? T: They’re not doing it for limbs anymore, and things like that. S: So why wouldn’t they keep records of fetuses? T: New York is still doing it. I think Nassau County has stopped registering them. S: So, in other words, if someone has a stillborn, you wouldn’t find any record of them…. S: Not even at the cemetery. T: Well, if it’s buried here, you’ll definitely find a record of it. S: They (the State) won’t have a record themselves? S: And you won’t need a burial permit for them? S: So, do you have a special section to bury fetuses? T: Beth Aaron-Beth Shalom. We have an area that we started using for fetuses because we felt that people didn’t want to buried over in that corner because it was near the highway, so we kind of made a little area out there. T: If the society had the room for it. Where most do…. S: So you’re saying basically this section is for like public…. T: Right. We get a lot of Orthodox Jews that don’t have burial plots for themselves yet. S: And it’s a plot for public burials, so it’s not marked at all? Is there a marker on it? T: Where? When you walk into the society, or the graves themselves? T: Yes, well as long as the funeral home brings out a marker, the grave itself is marked itself. S: What kind of society was Beth Aaron-Beth Shalom? T: It was just the name of the society that had a lot of grounds that we bought back years ago. They’re out of existence now, for maybe ten years or so, maybe longer. We actually have a couple of areas. We have an area in the First Greenpoint Sick and Benevolent where we do baby burials also. S: And again, it has nothing to do with that society, per se. S: Some people have a hard time finding children’s graves from many years ago, even when they know from the death certificate where they’re buried. Is there a reason? T: To find the grave themselves? S: Yeah, the early twentieth century. T: When you come out to the cemetery, there are all number of reasons. A lot of these graves are unmarked graves. There’s a society across the street that just has an area where they put their babies, unmarked in…. S: But you still would have a record of…. T: We just know that years ago, that’s where the baby was placed. S: Right. But you still have a record of the last name and the first name…. T: Right. Now also what happens is that societies put up what’s called a “baby marker,” and over the years the ground gets a little soft and the baby marker sinks into the ground. S: Oh, yes. A lot of them do. T: Because it’s granite, it’s heavy. S: And you can’t even read what was inscribed on them. T: That’s the old sandstone ones that are eroded. So what we do now is cement in the baby markers, so they’re not going anywhere. S: So you’ll put in a base of cement. T: Well, actually what we do is we open up a little hole, and as we stick the marker in, and they then cement around it. S: But you don’t do that for the old ones, just for the newer ones. T: Just for the newer ones. S: I read that there aren’t very many available individual burial plots in New York area Jewish cemeteries. T: It’s definitely dwindling. You’ve got to understand that once the ground is gone, it’s gone. I’m sure that in the area, some cemeteries might have areas that they still haven’t opened up yet. S: And you said you have like two hundred or something…. S: That are available for sale? S: In all the areas of your cemetery? T: In all of Mount Judah. S: Is the price that someone might pay for a grave based on location? T: No. All mine are the same price, though we do raise the price periodically. It hasn’t been raised in a few years. Still, I think it’s still fairly reasonable. S: What does one pay for a grave? T: We get 2500 dollars for a grave. S: Single and a double? T: It would be 5000 dollars (for a double) then. 2500 dollars no matter what. Even if you were to buy a family plot, you still need to multiply that by eight. S: What’s the hardest part about being a cemetery manager? S: About being a manager. T: About being a manager? Well, I guess it’s dealing with families that have problems. And I do feel for them. I guess it would be hard to work here if I didn’t. You realize that someone deals with a funeral home for a couple of days, but they must deal with the cemetery for the rest of their life. So if there was a problem at the time of the funeral, every time you come to the cemetery, you’re going to remember that. Whether it was the cemetery’s fault or not, you’re still going to remember that. S: What kind of problems do people, families have for the most part? T: Probably the biggest problem has to do with care, has to do with the quality of the care that’s given. S: So sometimes they see overgrowth and ask you how come it’s not cut? But you only cut it twice a year, right? T: Well, we actually cut on a four-week basis, or at least we try to. If the weather is really bad, I can’t force my guys to work. They go home. So I lose a day of work here, a day of work there…. S: When does most of the care get done? T: The care goes from April till just after the Jewish Holidays—September and October, depending on…. S: So once in the Spring and once in the Fall. S: You do a general cutting. T: Well, that’s when we care for the graves. S: So four times a year then. T: Yeah, it’s like four to six times between April and…. S: Between April and the High Holy Days. T: Yes. Usually about six times a year. S: As cemetery manager, can you do whatever you see fit, or do you have to consult with your Cemetery Board sometimes, and ask for permission to do one thing or another? T: It all depends on what we’re talking about. Here again I’m only the manager. I have bosses above me. So if anything major needs to be done, I’ve got to go to them. S: But they’re not the Board, they’re just your bosses. T: They’re my bosses. Then they talk amongst the Cemetery Board that actually runs this cemetery. And then, whatever it might be, if we need to go to the State Cemetery Board…. T: Not a lot. Most things can be handled internally. It depends on what we’re talking about. For instance, if someone wants to disinter a body from here and move it to another cemetery or move it to Israel, which—depending on how your rabbi feels... If people go to their rabbis... For most disinterments that take place here, the body is sent to Israel. Most rabbis won’t approve of a disinterment unless that’s the reason for it. S: Oh, really? Only if it’s going to Israel? T: Yes, most of the time. S: But that’s only if you’re Orthodox…. S: If you’re not Orthodox, you don’t…. T: Right, more Orthodox. And years ago, this was a more Orthodox cemetery. S: Are there religious restrictions you have to follow here at the cemetery, not legal, but religious. T: Well, we don’t necessarily abide by anything like that. We go by the wishes of the people themselves. So if a rabbi comes in here and wishes us to do something, and we can do it, yes, we will do it. If somebody comes in here and they’re walking in off the street, and they want to buy a grave, and they come to me and say, “Look, I’m a man. I can’t be buried next to a strange woman. " I say "Fine." I will search my records and find where I can put him in between two men, and if I promise the person that a strange woman will not be buried next to him, I will do everything that I can to make sure his wishes comes true. S: Is there a New York State Law where cemeteries have to be accessible to the handicapped? T: I guess there are certain laws that are in effect, and they have what they call “grandfathered-in” laws. We did some construction here a couple of years ago where we put a handicapped-accessible bathroom in. It jus seems like people come to cemetery and the first thing they need to do is go to the bathroom. But unfortunately the way our front door is, we have a lot of steps coming up to the front door, so—as a matter-of-fact, I just had it about two weeks ago. Somebody came in—the driver of the car came in and said, “Look, my mother and my aunt are handicapped. They can’t come in. Can you come downstairs to talk to them?” And I gathered whatever records I needed, and I went outside to talk to them. S: And then you said you’re cemetery is grandfathered in. You’re an older cemetery…. S: The fact that you’re Jewish—what kind of connectedness do you feel with your job because you’re Jewish? Also, is it necessary to maintain a certain amount of detachment in your job because of the sadness that may come each time a family member must bury a loved one? T: Well, when I first started here, my wife was of childbearing years, and I would do a fetus, and naturally that would hit my heart because we were in the process of having our own children. So yes, I can feel a lot more for the person. It's been twenty-three years later now, and I do a lot of fetuses on a yearly basis, and, yes, I do feel badly, but unfortunately I can’t feel bad the way I used to. That’s number one. Number two, where it bothers me, is after knowing a person for maybe twenty-three years, having a relationship with them for that long and now opening their grave to make their burial. I have gone outside to a number of burials in the last ten years that is sad, but unfortunately, this is what life is. You get born, you die; it’s inevitable for everyone. S: Have you an interesting anecdote or two, any interesting stories about your experiences here? Anyway, he had a son that died tragically when he was in college, and he erected a bench on the college campus, and he had to endow it. And the college campus might have wanted like a million bucks from him, or something like that, to endow this bench. And the college, the college was sold or something like that, or they were moving, and he went to the new college that was kind of taking over everything, and he said, “Hey look. They got a million bucks for this bench. If I need to give you a little more, I want to make sure the bench is going to be here for my son.” And they said, “No, everything was fine. The endowment was still fine.” That made him a happy a guy. Finally a few years later he passed away himself. And it was on Christmas, and I was on vacation. One of the girls knew that I had a great relationship with this guy. They called me because the son—one of his sons—asked for me when he called, and they called to tell me to tell me that their father had passed away. And one of the girls said, no, I’m on vacation, but they would definitely call me. And they called me, and I was home. I said I would come to the funeral. I was on vacation, but I came to his funeral. And when the son saw me out at the grave, he came up to me and gave me a big hug and a kiss, and he says to me, he goes, “My father would really appreciate that you were here.” He goes, “I know you were on vacation. So whatever your plans were, I know you stopped them for my father.” He goes, “You don’t know what that would have meant to him.” And I said, “Your father was like a father to me, all these years that I knew them. And he was just a great person.” And I still go out to the grave a couple of times a year. S: That’s nice. It’s a nice, positive memory to have. T: It is. You know, and I’ve got a number of people here like that. I really enjoy what I do, otherwise I couldn’t be here. S: How many years are you going to do it for? T: Well, like I said, I’m here twenty-years. I still have a number of years till retirement, so…We’ll see what happens. S: Is there anything else that you think people should know that I haven’t asked? T: Well, the main thing is, and you’ve got to understand it’s not just the cemetery, it’s all cemeteries. They try. We have no control over the weather. We have no control over what happens. G-d forbid you have a winter burial and conditions are bad, it's twenty degrees outside and everything is icy and frosty, and you know, the men—the men is what makes the cemetery. It’s not necessarily me, it’s not necessarily the people in the office, but it’s the men on the outside that really--they don’t get any accolades from anyone literally. Yes, I go out there and tell them they’re doing a great job, whatever it might be. But the fact is that it’s not an easy job. In the summer, it might be ninety outside, but in between the stones it’s over a hundred degrees; the heat just radiates off the granite. And you've got to understand that it’s all physical labor that does this. It’s not machine-done. Granted, machines cut, but—actually when I first started here, we used shears to cut the ivy; it was all labor then. At least now we use gas-powered tools. Things have changed over the years. We’re computerized now. Years ago there were no computers. S: Do you think everybody is satisfied with the cemetery database, more or less, or are there certain things they want to change about it? T: Well, I think, actually I get a lot of very good feedback from everyone that calls after being on our website. And there are definitely some changes that need to be made, and I’m trying to get those changes in. S: What kind of changes would you like? T: You've got to understand that change in a cemetery takes time. Cemeterians are used to doing things one way, and when you start to change things, and people in the office—a lot of people aren’t conducive to change—so we’re trying to get the database updated a little with information as quickly as we can. S: How often does it get updated? T: Actually, since it went online, I don’t think it has been. S: In other words, when there is a new burial, is it updated? T: The burials, they go on daily. That’s an automatic thing. S: So what hasn’t been changed? T: The physical information that’s on there. T: Yes. It really is not necessarily conducive to a person looking at it, because when you look at it, you really don’t know what any of that stuff means. For instance, I can tell you a grave number, but a grave number doesn’t mean anything to anyone. S: Well, aren't the rows numbered from back to front, and the grave numbers from right to left? T: Well, not necessarily. All of a sudden you could do five lines of adults, and then, all of a sudden you get a baby or a child line in there. These graves might be only five foot long. S: What can you do? S: So how can you change the database so that it would be more specific? T: All of our societies have been numbered, and all the numbers correspond, to an entrance gate now. And then each line is numbered. Not physically, because you don’t see it on the path, but if you know the system and you come in, we’ll tell you exactly where the grave is. S: If there was a tar path running down the middle of the plot, would you need permission from somebody to stencil in the row numbers? T: Truthfully, I bought paint a number of years ago, to actually number every five lines, or so, to make it easy for someone who’s counting or whatever, and I just never got around to doing it because, unless it’s done at certain times of the year, I just don’t have the time…. S: You don’t have the manpower too. T: That’s what it comes down to. S: Todd, thanks a lot. You’ve been great. T: Listen, I love what I do, I really do. I love helping people It’s maybe what I’ve been put on this earth to do. I don’t know, you know? T: What can I say? I might not become a wealthy man, but I’m happy. What else can I say?